Africa could generate 50% of its energy from renewable sources by 2030 if they were to follow guidelines laid out in a new report from the International Renewable Energy Association (IRENA). 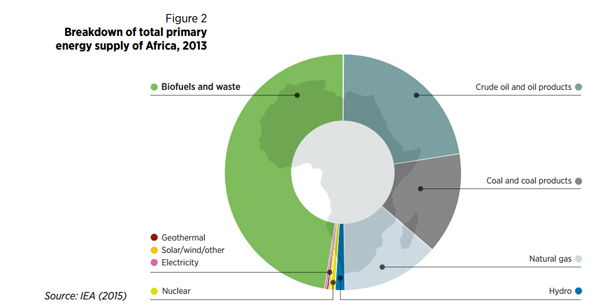 The Africa 2030 report is part of IRENA’s global REmap 2030, which outlines methods to double the share of renewables in the world’s energy mix by 2030. (Scroll down for full report). The report suggests that hydro and wind power could each reach around 100GW capacity, followed by solar at about 70GW. The report recommends 14 approaches that, if adopted, would accelerate the continent’s renewable energy transition. These include adopting enabling policies; a regulatory framework to catalyse investment, measures to attract investors, and promoting off-grid renewable solutions to increase energy access and reduce poverty. In order to match Africa’s economic growth and changing lifestyles, the need for reliable access to modern renewable energy is expected to at least double by 2030, IRENA claims. In 2013, renewable energy accounted for just 5% Africa’s total final energy consumption (TFEC). By targeting the four methods with the highest deployment potential: modern biomass for cooking; hydropower; wind; and solar power, these base levels could reach 22% by 2030. The report states that if the continent were to receive $70bn per year over the next 15 years, with $45bn used for generation capacity that percentage could double to 50% which would see a reduction of 310 megatonnes of CO2 in emissions when compared to the baseline scenario. Out of the available renewable options, modern biomass methods may prove to be the most beneficial in the long-term. Currently, half of all energy use in Africa involves traditional biomass consumption, which entails health risks due to smoke inhalation and social disparities in wood collection. Modernising biomass will improve health, create social benefits and reduce environmental damage. The renewables revolution appears to be particularly prominant in South Africa, as new statistics from global research and consulting firm GlobalData reveal that the country's concentrated photovoltaic (CPV) capacity will reach 193.3MW by 2020. Harshavardhan Reddy Nagatham, GlobalData’s analyst covering power, said: “South Africa’s climatic conditions are highly suited to CPV technology, due to high Direct Normal Irradiance (DNI) rates throughout most of the country and the availability of vast expanses of land. Last week, South Africa joined a host of other African countries in submitting their national climate action plans to the UN ahead of December's Paris Climate Summit. South Africa pledged to peak emissions between 2020 and 2025 was bound by ‘significant rigidity in the economy’.